NEW YORK - Stocks advanced Thursday, with the Dow Jones industrial average crossing 11,900 for the first time, after big consumer names like McDonald's Corp. gave investors hope that earnings would be strong despite a slowing economy. The widely followed Dow index rose as high as 11,917.68 Thursday, topping a previous intraday high of 11,872.94. On Tuesday, the Dow closed at 11,867.17, its fourth record close in two weeks. Also Thursday, the Standard & Poor's 500 index reached a 52-week intraday high. Is it just me, or is this a new thing? We keep hearing about these new record highs only because the market has been so stagnant for so long. The Dow was reaching a new high on a routine basis during the entire Clinton administration. In fact. 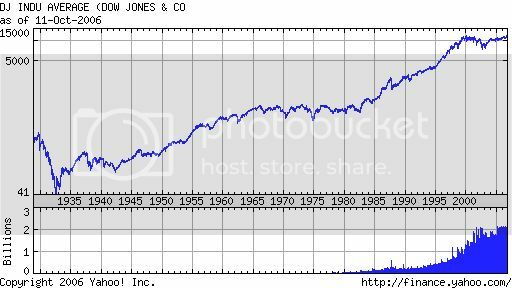 record highs for the Dow were a routine occurance starting in the early 40s and continuing until Bush the younger took office (although they were slightly less frequent under Nixon, Ford and Carter. )But there is no denying that Bush Jr signaled the death of record highs compared to what we had seen under Clinton. It's just you. You are hearing about record highs because, well, these ARE record highs. With high oil prices, two wars, troubles in North Korea and Iran, it is quite remarkable. Got to give credit to your President for this great economy, don't you? Sounds like you HOPE for economic failure. Why? Do you hate the Republicans, your President, and your country that much?